Last Sunday, HBO began their World War II miniseries on the Pacific Theater of Operations, simply titled The Pacific, as their long awaited follow-up to Band of Brothers. Band of Brothers was one of my earlier influences in the history field, and ever since high school, seven years ago, I've been awaiting for such a follow-up, which has been worked on in the ensuing years. The series already has paid off in the long wait between 2002 and now. In the past couple of years, I've graduated with two degrees in history (one was specifically in Military History), and as such, my views on commercial history have changed a lot since I first saw it. 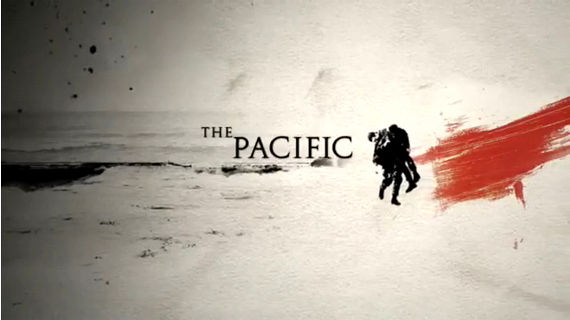 The Pacific follows three soldiers, Robert Leckie, John Basilone and Eugene Sledge, and where Band of Brothers is based off of the book by the same title, this series is following the memoirs of Leckie and Sledge (Helmet for my Pillow and With the Old Breed, respectively), while Basilone is a well known figure in the Pacific War history. As such, the series has a somewhat different feel, apart from the differences in location and military units. Instead, the series has started off with much more of a personal story, rather than the story of an entire unit. The Band of Brothers comparisons is something that the Pacific will be unable to really escape from, and that carries with it a need for some changes in how the stories will be told, as well as certain expectations with its appearance and what sort of story that it will be telling. To be bluntly honest, this isn't a historical story in the slightest - it features real stories and actions, but care should be taken to remember that primarily, this is a dramatic war movie, stretched out over ten nights. It'll be highly accurate, with a lot of care in that department, but history it is not. What I really appreciate about this sort of series is the ability to get younger students (upper high school and the like) interested in World War II history, which in turn can act as a sort of gateway to other conflicts. In my own studies, I was highly interested in the Second World War, for all of its complexities and differences, and things to study. It's something that continues to fascinate me to the present day, and I'm sure that I'll be fascinated for a long time down the road. Band of Brothers, when it was released, most certainly hooked a number of people, getting them interested in the character stories, and going from that point onwards to other happenings. This miniseries focuses extensively on the Pacific theater, with the Marines who fought in the island hopping campaigns that dug into Japanese territory. While the European theater has been extensively covered with movies, the Pacific has had a lesser degree of interest, for whatever reason, and I'll be interested to see how well this comes off in the series. From the first episode, it's clear that there's quite a lot of attention being paid to the characters and their own stories. This first episode is centered around Robert Leckie and the 1st Marine Regiment as they land on the first engagement at Guadalcanal as part of the Battle of the Tenaru, the opening actions for the Guadalcanal campaign. The U.S. Marines landed and secured the islands, but were surprised when the Japanese defeated their supporting ships off shore. The Marines secured the airstrip on the island, and engaged Japanese soldiers on August 21st, in the middle of the night, when the Japanese came across their lines. The first assault was turned back, and the second attack was once again turned back by mortars and heavy machine gun fire. In the morning, the U.S. Forces counter attacked, and over the course of the 21st, the US killed most of the Japanese forces, with just a handful withdrawing. This first episode shares a pretty limited view of this battle, with Robert Leckie taking part in the first assault over the night and through to the next day. Leckie was part of this battle in real life, as a machine gunner, and the episode captures, fairly effectively, the horrors of that first engagement, from both the determination of the Japanese soldiers in the 17th Army (attacking or committing suicide after they were injured, taking American soldiers with them) and the measures that the U.S. forces took in retaliation. The Pacific is very different from Band of Brothers, as the Pacific Campaign was vastly different than the European one. There were numerous lessons to be learned in these differences, and I'm eager to see how the remaining aspects of the campaign play out for this series.